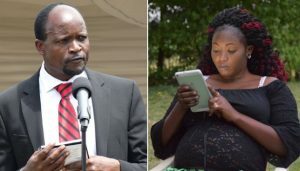 A DNA test to ascertain the paternity has proven that Migori Governor Zachary Okoth Obado was the biological father of the late Rongo University student Sharon Otieno’s baby. Both Sharon and the governor’s baby were stabbed to death in a brutal murder that has shocked the country. The finding coming even after Obado accepted paternity of the child, places the governor back at the centre of the investigations into the brutal murder of Sharon and her baby. Obado was subjected to a DNA test following murder Sharon Otieno. DCI boss George Kinoti said test results were key in guiding investigations to unearth the motive behind the death. Following the findings sources indicate that detectives may grill Obado once again over the cold-blood murder of the 26-year-old lady whom the governor had an illicit affair with and impregnated. According to Daily Nation , also to be interrogate is Obado’s wife, Hellen, after it emerged she exchanged some provocative text messages with Sharon a few days before the seven-month pregnant woman was found dead.